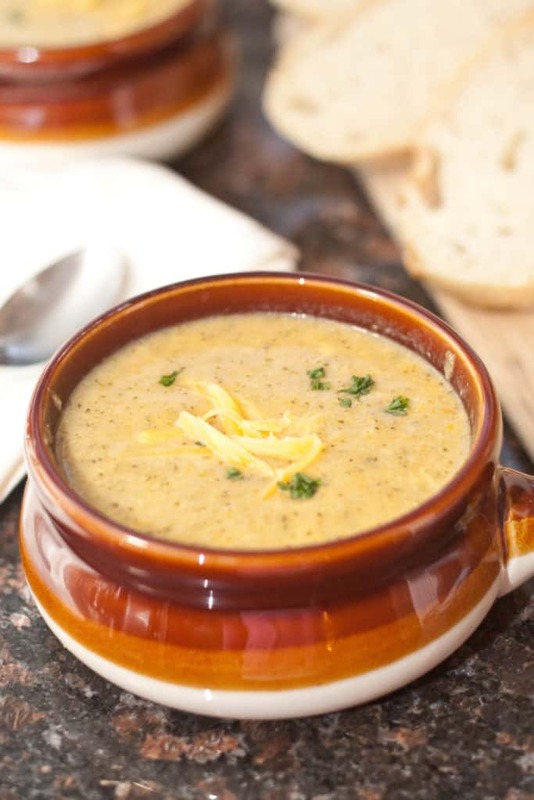 Perfect for fall, this Crock Pot Broccoli Cheddar Soup From Scratch is cheesy and creamy but without any cream or store bought canned goods. Is there anything more comforting than a big bowl full of creamy, cheesy soup? Definitely not. Even better is when it only takes a couple minutes to throw together like this Crock Pot Broccoli Cheddar Soup From Scratch! Little M’s Grandma is visiting from New Hampshire this week and since I’ve started a new job I’m only able to take one day off while she’s here. That means after a long day at a new job I’m rushing home to be able to spend time enjoying all the rare and precious Grandma time that my mom is able to get with her only grandchild. So that means the dinner needs to be easy. Which most all of our meals are these days. But if ever there was an incentive to have an easy, but delicious dinner ready, Grandma visiting has to be the best! Even better, we used some of our Homemade Chicken Stock and was able to put to use our new Condensed Cream of Celery Soup From Scratch! Then our cheese of choice for all things delicious is Tillamook’s Sharp Cheddar. It’s the primary reason we have a Costco membership, as my mom learned while she was here and is evident by the multiple lbs of cheese that will be smuggled back to NH in her luggage. As with a lot of our Crock Pot meals, it’s just a toss of everything into the trusty Crock Pot and cooked on low for 10 hrs. High for 4 hours or low on 6-8 would also be fine. The only reason we did 10 is solely because that’s how long I’m away from the house on a workday. After 10 hrs it was ready to be blended. Now if you’re lucky enough to have an amazing Vitamix then you don’t even need a Crock Pot and you can just toss all of your ingredients in the Vitamix and then it’ll even heat it enough to serve. It’s been on my wish list for a loonngg time. But until then, we have a handy, inexpensive immersion blender that works great for soups like this. Once it’s all blended smooth then it’s time to add all of the cheese. A little more cheese (because why not) and then a touch of parsley (really that’s only for color), served with a fresh homemade bread, and you have an easy low maintenance dinner that’s perfect for a busy weeknight when you want to be able to maximize Grandma snuggle and book reading time. Enjoy!! 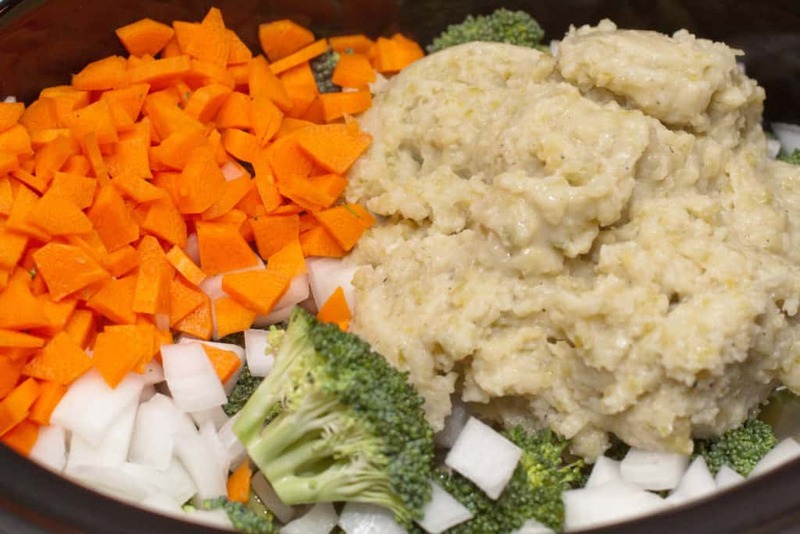 Happy Fall Crock Pot cookin’! 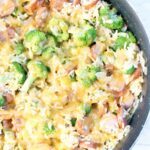 Creamy, cheesy, and complete comfort! Add broccoli, onion, carrot, and garlic to a Crock Pot. Mix pepper, salt, and cayenne in a small bowl and sprinkle over veggies. Mix and then add condensed cream of celery soup and chicken stock. Cook on low for 6-10 hrs or high for 4 hrs. Keep on warm. 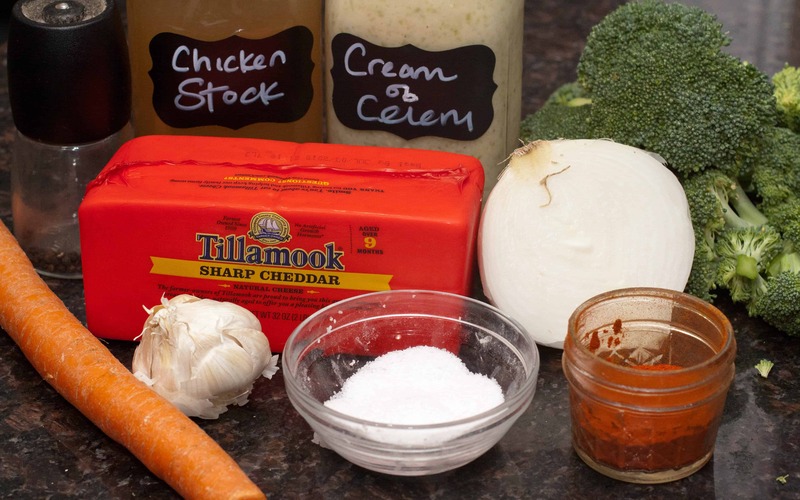 With an immersion blender, blend soup until creamy. Add cheese to soup 1 cup at a time and mix well so cheese melts. Add all of the cheese and mix until fully melted and creamy. With the cooler weather just around the corner, comfort food in bowls is going to be a staple for the winter months. Homemade soup is THE BEST. I love making it in the crockpot. It cooks all day while I am busy…then dinner is magically ready. This sound delicious and would be a welcome addition on a chilly day. I love broccoli cheddar soup but never made it at home before. I love how easy it actually is. I can’t wait to make this! I almost always order broccoli cheddar soup at Panera bread. I keep telling myself that I should just make it at home but always thought it was too much work. 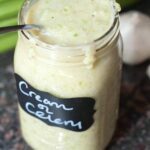 I didn’t realize I could make this in the slow cooker or the vitamix! I’m going to bust out my vitamix! What a great idea for a crockpot recipe. I love the easy button often. Life gets so hectic that it’s nice to have another feather in my cap. Saving this recipe, I need to use it soon! I wish I had a big bowl of this soup right now. It’s chilly and rainy and this soup sounds just perfect! Aww…grandma time is the best. My mom was just here for a couple weeks spending time with our son. It makes me really happy that they get to have that time together. I’m sure that soup was a big hit. It sure would be around here! We love soups and this one would certainly rank right up there. 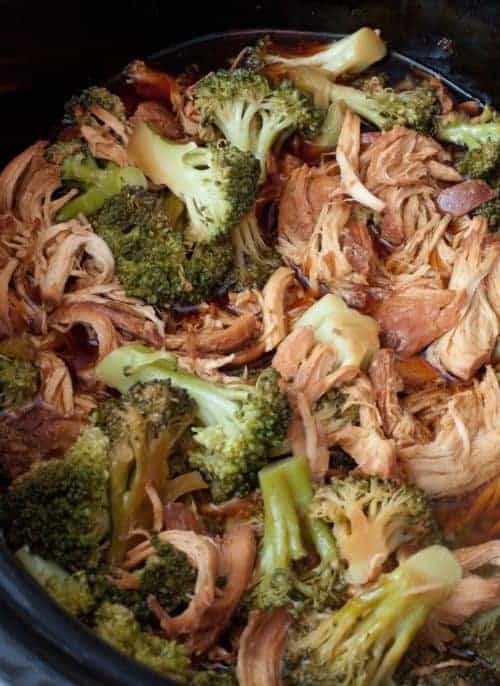 A crock pot is a life saver and when you have great homemade ingredients to start off with – you’ve got a winner of a recipe. And we are members of Costco — we find lots of goodies there that we love cheese being just one of the many things we pick up. We will definitely try out your version of broccoli cheddar soup. Broccoli and cheddar are just meant to be together, and you seem to nail it with that combo on the reg. (I still need to make those bars!) This looks incredible! And the fact that it’s made in a crock pot is a bonus. I do crock pot/slow cooker stuff on Sundays in the cooler months, and this is going on my list. I cannot WAIT. Thanks for the tip about making this in the vitamix. Brilliant. I keep hearing that soup can be made in the vitamix but I haven’t yet tried it. Now I know what kind it will be. Sounds delish plus super easy. My kinda recipe. Thanks. I can imagine how tasty and comforting this soup is on cold winter days! Definitely a recipe I’d like to try! I love slow cooking, especially soups. Will give this a try! 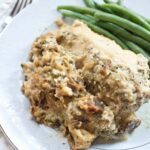 This recipe has become such a classic in the family table; this recipe is so simple and so good love the idea of using the slow cooker for this recipe. I love all the homemade ingredients in this. Can’t wait to try it! We love broccoli cheddar soup. I can’t wait to try your crockpot version. Oh my, what a hearty and delicious looking soup that is. Looks so creamy even without the addition of real cream. I would love to try your recipe sometime. I’ve been craving a warm bowl of soup all day and this would surely hit the spot! It looks and sounds delicious. I love a good creamy soup – especially broccoli. But, now that I’ve read the ingredients, I have to head over to your cream of celery soup, because that sounds just amazing! I seriously think i could eat my weight in Broccoli cheddar soup!! And I’m not even the biggest broccoli fan. Ive never made it in the crock pot!!!!! 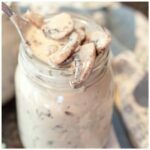 Where has this recipe been all my life! Girl I HAVE eaten my weight in this soup. It is soooo good! 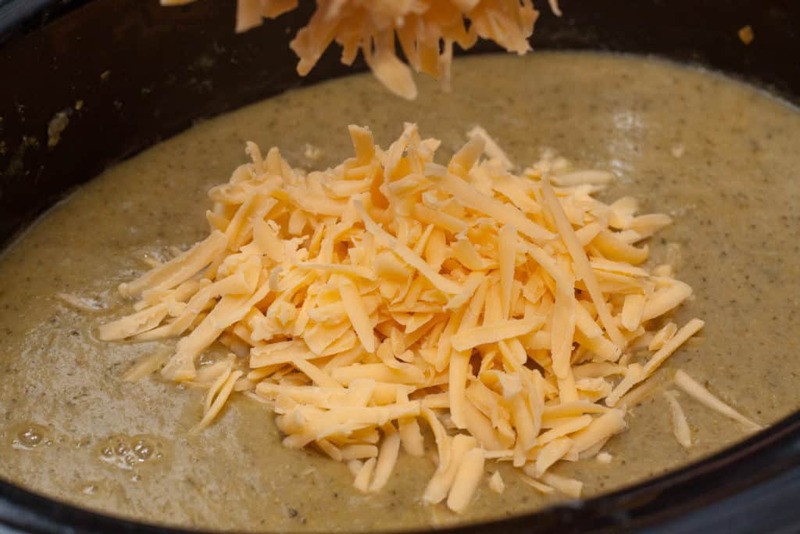 Broccoli cheese soup is one of my favorites, and I love that this recipe is full of so many fresh ingredients and tons of yummy cheese! Perfect for a cold day. I love vegetable and cheese soups and this one looks full of flavour with all those homemade ingredients! I’ll have to check out your from scratch cream soup recipe. I love broccoli cheddar soup! This looks delicious. I love broccoli and cheddar soup but have never made it myself. Exactly what you need to warm up in the winter! I am a crock pot lover. No IP for me. This recipe is just what we need for ALL the snow days we are having. Nothing better to warm up with after shoveling than a nice hot bowl of homemade soup. Yes! It’s the main thing I use the IP for! 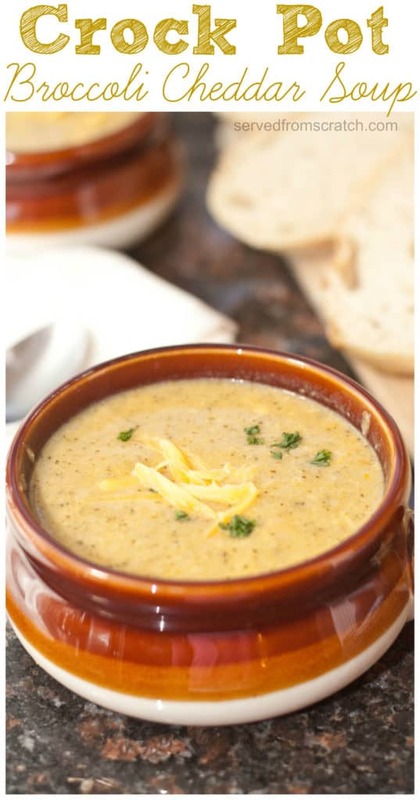 I LOVE that you can make this broccoli cheddar soup in the slow cooker or a Vitamix! It definitely doesn’t get much easier than that! And it’s so comforting too! I can’t wait to make a big batch this weekend and eat it throughout the week. With everything that you cook, you absolutely DESERVE a VitaMix! Seriously. I do have one — and this soup has just risen to the top of my to do list. 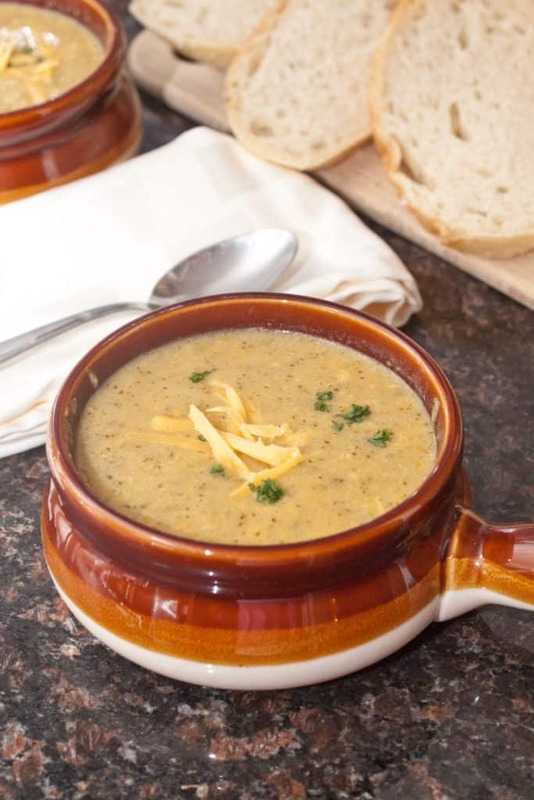 Love the dump and go nature of any crock pot soup — and the combo of veggies, cheese and your amazing cream of celery soup just sounds like the most cozy bowl of ‘nom! Enjoy the special time with your grandmother and congratulations on your new job!!! LOL, I love how your mom snuck cheese home! I would totally do that! There are SO many yummy things Canadian Costco doesn’t carry that American Costcos do. I made my own broccoli cheddar at home today but didn’t think to add cream of celery. I’ll have to try that and see how it tastes! Is it to make it smoother? I was wondering what I was going to do with that extra head of broccoli that’s in the fridge. This recipe would be ideal. I’m glad your directions are for a crock pot instead of on Instant Pot. The addition of the cheese looks like it really gives the soup that extra zip of flavor. Great sounding recipe. I looooove a good broccoli cheddar soup. A hands-off crockpot version sounds like a fantastic idea. I like that you’ve got lots of carrots in the soup too – I find that makes a much tastier, slightly sweeter base. I bet it smells fantastic to come home to the house with this bubbling away. Cheers! Who knew it could be so simple? 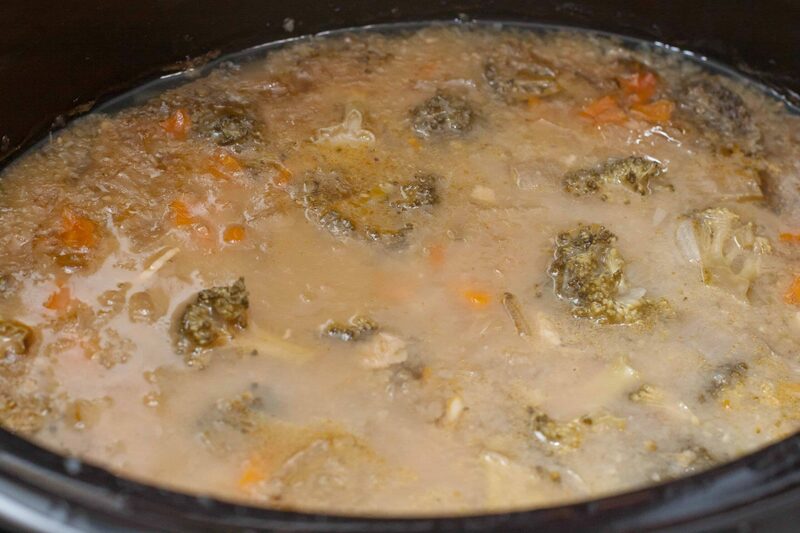 I’m married to my crockpot this time of year and so happy to find another soup recipe because….well, WINTER!! This sounds absolutely delish! 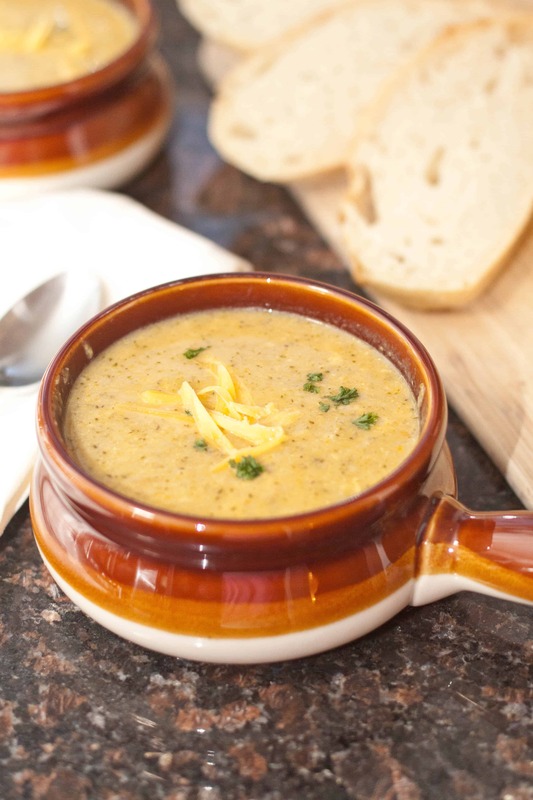 Broccoli cheddar soup is the best way ever to warm up on a cold day! I’ve never made it in a slow cooker, but I love the idea of putting everything in the slow cooker and coming home to soup hours later. Perfect comfort food! I remember when my daughter was young – Grandma (and Grandpa) time was the best! And having a slow cooker, hands off meal makes any day even better. Especially, these chilly winter days we’re having right now. This is the perfect time to pull out the slow cooker and make a healthy batch of broccoli cheddar soup. Thanks! Homemade broccoli soup is so so dreamy! I can’t even fathom how delicious this would be, with all that glorious cheddar. Cheddar is, hands down, my favorite type of cheese. I do throw roasted broccoli in my cheddar macs once in a while, and the combo is dynamite. I need this soup in my life; in my bowl, and in my mouth. Stat. Lol.